Cave Spiders belong from normal Spiders. This one is smaller, its eyes are red and its skin is dark green. This creature is more dangerous than a normal Spider, mainly beacause when bitting, drops venom to the player. Cave Spiders generate when a payer is near to its spawning place. Then they go directly to attack the player. 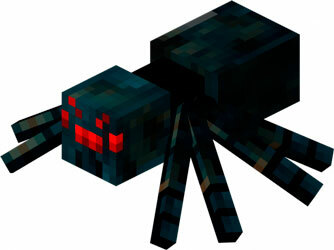 These Spider variants will only generate in the abandoned mines through spawners already placed in certain areas surrounded by nspider webs, or also inside some dungeons.